Feds: Lafave accused in "False Invoice Scheme"
Former Milwaukee County Register of Deeds John LaFave is under federal investigation for his part in a "false invoice" scheme totaling more than $2.3 million, according to search warrant documents unsealed Tuesday. LaFave, who retired April 12, is accused of arranging the scheme with Superior Support Resources Inc., a Brookfield company that processed documents for his office. The affidavit for a federal search warrant explains how LaFave asked Superior Support Services for false invoices at the end of 2014, 2015 and 2016. 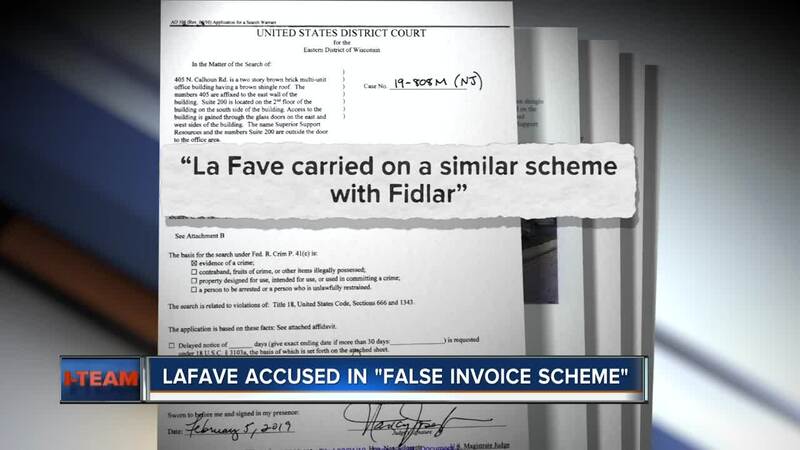 The records show "La Fave carried on a similar scheme with Fidlar," another Milwaukee County contractor. In that case, the documents explain, the county pays Fidlar on a regular basis and unused funds are supposed to go into the County's general fund. However, the documents indicate La Fave "would direct Fidlar to hold onto the revenue generated" so he "could utilize this "credit balance" to pay for other services... outside of the Milwaukee County procurement rules." The money in the general fund is used to lower taxes paid by Milwaukee County residents. The goal, according to investigators, was to spend all the money in the Register of Deeds office budget so it would not go back into the Milwaukee County general fund. Investigators say the scheme ultimately stretched from 2010 through 2017 and involved more than $2.3 million in false invoices. “Superior Support Resources, Inc. has done work for the Milwaukee County Register of Deeds for many years. Our work was related to indexing documents and redacting private information. Earlier this year, the FBI came to our office to get a variety of records and seek additional information about our client. We are cooperating fully with the authorities and plan to continue that cooperation. We are confident we have not done anything improper, and we are performing an internal investigation to verify as such. At this point, we have not seen anything that is of concern." LaFave spent more than 15 years in a low-key county post until February, when his office in the courthouse building was raided by federal investigators. Reached for comment Tuesday, LaFave’s attorney Michael Maistelman could not comment on the investigation. “The Wisconsin Supreme Court rules preclude us from commenting on an ongoing matter,” Maistelman said.